We’re often asked if teachers can use SMART and Promethean files in Mimio when showing MimioStudio interactive software to new users. This question often comes from teachers whose school has converted from SMART boards or Promethean boards to Mimio. We love being able to answer this question with a resounding YES! In addition, it’s fun to see the look on teachers’ faces when we share with them how simple it is to add their existing PDFs or PowerPoints into a Mimio lesson. Publishers often provide curriculum in the form of PDFs. These can be opened in Mimio or inserted directly into an existing Mimio lesson. Teachers can then use the Zoom tool to focus in on a particular problem or diagram and even annotate right over the top of the inserted file. There is a lot of time that goes into creating quality interactive lessons and curriculum, so it is no surprise that teachers are very concerned when their interactive hardware changes or they change districts and no longer have the same interactive technology. We’re glad to say that you are able to open PowerPoint, PDF, SMART and Promethean files in Mimio, so all of that existing content you’ve spent time creating can be put right to work! 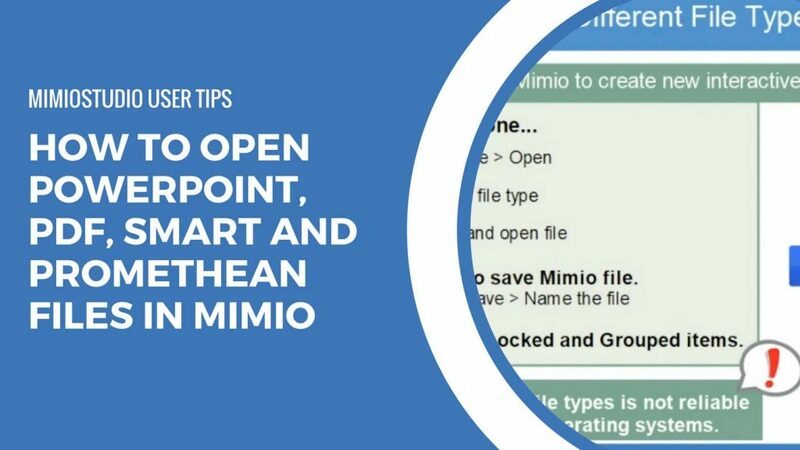 Watch our video to see how easy it is to open PowerPoint, PDF, SMART and Promethean files in Mimio. One of the benefits of MimioStudio opening so many different types of content is that you now have even more locations from which to gather ready-made content. Instead of just looking in MimioConnect for MimioStudio lessons, you can find ready-made interactive whiteboard lessons in SMART Exchange for SMART Notebook files, and the Classflow Marketplace (the new home for Promethean Planet content) for Promethean Flipcharts that can be opened in MimioStudio. Also, if you are using a resource like Teachers Pay Teachers to find interactive content, you may also be able to use more of the content that you find there. Want to Try SMART and Promethean Files in Mimio for Yourself? There’s no better way than to see for yourself how opening PowerPoint, PDF, SMART Notebook files and Promethean flipchart files works in Mimio. Simply click here to try MimioStudio out free for 30 days and put the software through its paces! If you’d like to try MimioStudio with Mimio hardware, contact us regarding our loaner program for hardware and we can set you up with a MimioTeach or MimioPad for your classroom free for 30 days. We would love to hear how you have leveraged your existing content in MimioStudio. Leave us a comment below!